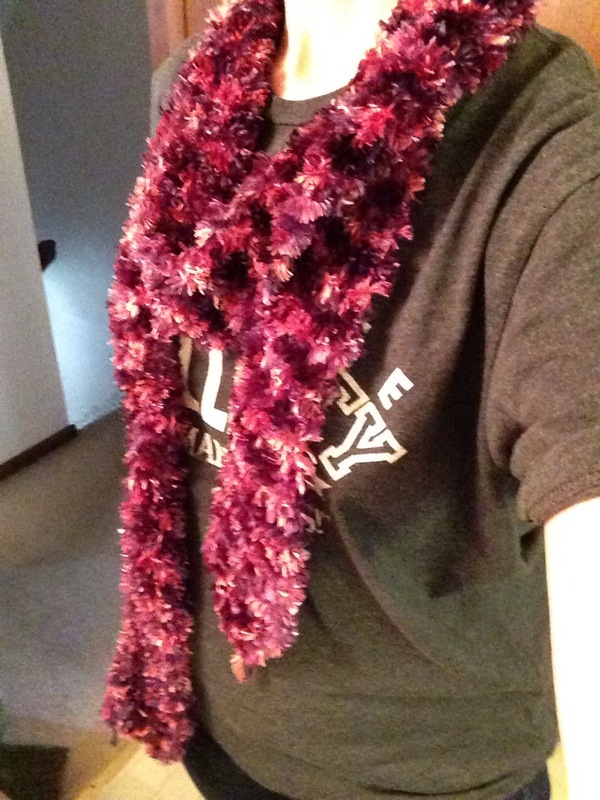 For the second day of my, Scarf of the Day, I’m sharing something I made when I first started knitting. My mom and I went to a craft store and I found this beautiful frilly yarn in purple and pink. It was my first project knitting from two different strands at once. What I did was cast on 18 stitches and knit four rows of the purple then four rows of the pink carrying the yarn as I went. From what I remember it was difficult to keep track of the stitches because I was using a different frilly yarn that I had never used before. And this scarf is super long because of the little number of stitches and the fact that I used up both skeins of yarn that I bought. BTW my T-shirt is from Community.